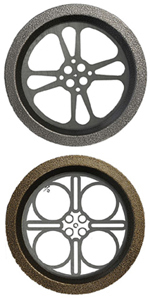 Authentic 35MM Goldberg Quality Film Reel Door Pulls. 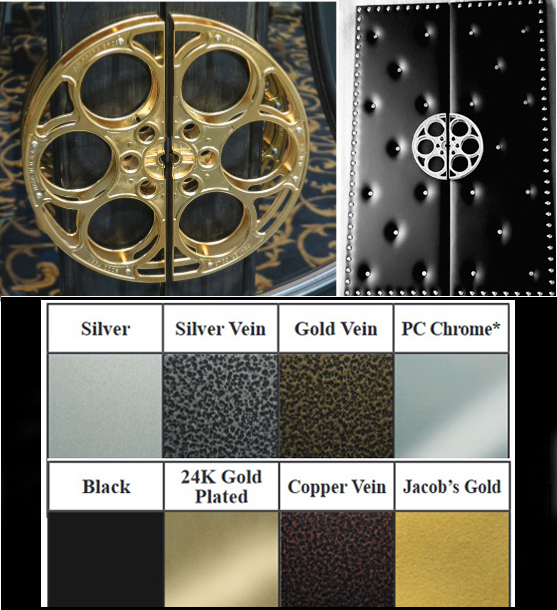 Add a Visual Hollywood Experience to your Home Theater! Dimensions: 15" H x 7 1/2" W x 1 3/4" D.
Includes a Set of Two Pulls (1 Left and 1 Right). Available in your Choice of FIVE Finish Colors or optional 24k Gold. 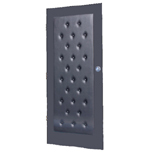 Our Basic Door Panel can be applied to any existing door, and does not require removal or modification of existing door hardware. It will fit over any flat or 6 panel door. On a standard door, the panel leaves 4" of the existing door showing on the top, 4" on the left and right sides and approximately 8.5" on the bottom. The area around the panel can be painted to match if desired. Installation is simple- just attach the 6 mounting brackets to your existing door using the supplied template and hang the panel on the brackets. 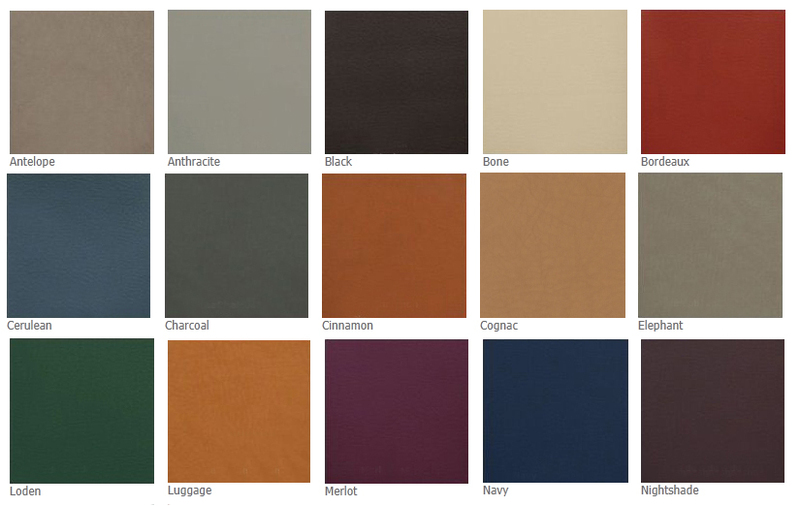 CLICK HERE to view Vinyl Door Colors. 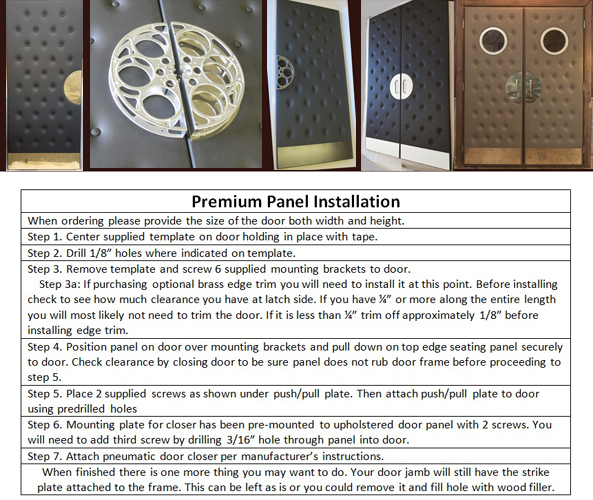 Below are standard door sizes and the panel size that will fit properly on your door. Please note prices are for one panel. 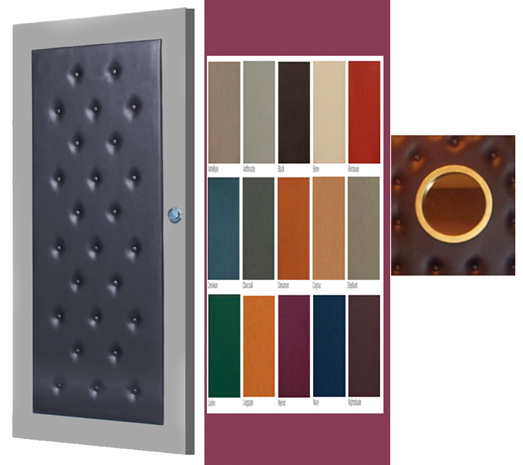 If you want to upholster both sides of your door you will need to order two panels. If you have double doors and would like the inside and outside of the doors to have panels you will need four panels. Please measure carefully as we are not responsible for incorrect measurements. ADD The Optional Round Mirror Port Hole for an additional $99.00. Your choice of mirror and trim colors. The Panels are custom fabricated using all parts and colors as ordered. 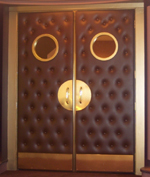 Decorate your Home Theater Door with our Premium Customized Upholstered Door Panel. 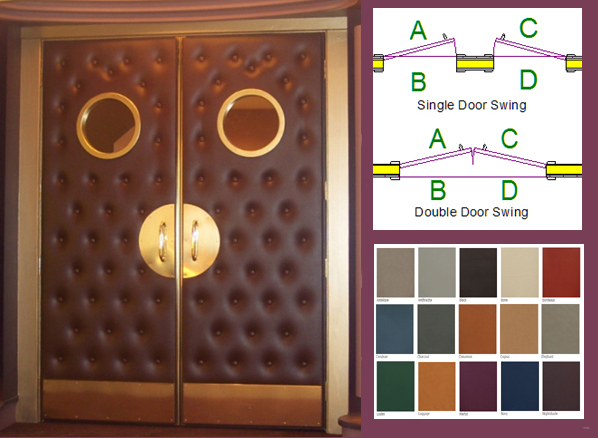 Each Door Panel includes a Round Mirror with your choice of Mirror and Trim colors, Door Pulls, and Kick Plate hardware. Your choice of vinyl Colors. Easy to install onto New Door Installations, or Existing Doors. Door Size 24"W x 80" Panel Size 22.5"W x 78"
Door Size 26"W x 80" Panel Size 24.5"W x 78"
Door Size 28"W x 80" Panel Size 26.5"W x 78"
Door Size 30"W x 80" Panel Size 28.5"W x 78"
Door Size 32"W x 80" Panel Size 30.5"W x 78"
Door Size 34"W x 80" Panel Size 32.5"W x 78"
Door Size 36"W x 80" Panel Size 34.5"W x 78"
Authentic Theater Style Window Ports Convert Your Doors Into Hollywood Cinema Entrance Doors. Our Goldberg Metal Door Window Ports are set up for 1.75 inch thick doors, and include Glazing Tape. The Designs are Etched into the Glass and are Semi-Transparent. The Window has the same Metal Frame on both sides of the Door. 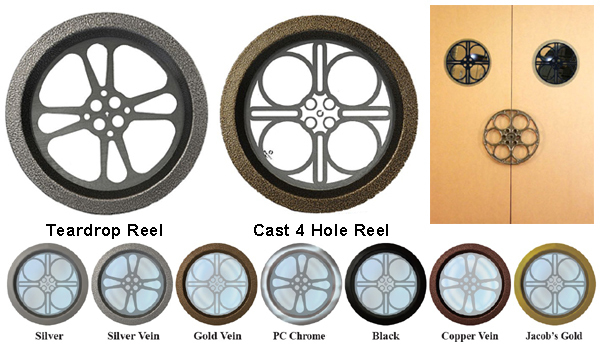 Your Choice of either the CAST 4 HOLE STYLE REEL or GLASS ETCHED TEARDROP STYLE REEL. Available in your choice of FIVE Metal Colors. Please allow 3 weeks for fabrication. Price shown is for one Port Window.